Last Friday, Catalonia officially declared itself independent, after 92% (of the 42% of citizens that showed up) voted in favor of independence on the 1st of October. Arguments for an independent republic, led by the regional president Carles Puigdemont, were that the region has the moral, economic, cultural and political right to its own autonomy. The region already had one of the highest levels of autonomy of Spain with its own parliament, police force as well as a president and ministries. Yet, over the past few years support for total independence had grown as Spain was going through a tough economic crisis. Many Catalans were still angry about the fact that seven years ago the Spanish court reinterpreted parts of the 2006 Catalan statute of autonomy. Initially, this would have led to greater independence for the region, but the court reversed it. The region, with Barcelona as its capital, has long been flourishing. It is one of the richest regions of the country, accounting for almost 20% of the economy. Businesses are doing well and unemployment rates are low. Despite this, the Catalans felt undervalued, contributing more money to the Spanish economy than they received in return, especially when taking the crisis in mind. The Catalans see this referendum as a victory, but how does the market respond to the referendum tumult? And how will this further evolve? Catalans are highly convinced that they will be able to stand on their own feet as a result of their successful economy. Yet, concerns have been raised about its ongoing economy and the central government reaction to the referendum does not seem too promising either. The Catalans see this referendum as a victory, but how does the market respond? Weeks before the independence vote would take place, tensions on a political level were on the rise. After the official announcement of a vote back in June, backed by the Catalan government, Spain’s national government declared it illegal, arresting several Catalan officials and threatening the regional president to remove him from his office. However, markets reacted fairly calm. A good indicator for investor’s confidence in the market is the ten-year government bond yield of a country, which is seen as a very safe investment. Thus, when confidence in the market is high, the price of these government bonds drops and yields increase, since investors feel that they are able to find higher return investments without too much risk. At that point, demand for government bonds decreases as investors do not need to put their money in a low-risk investment with low returns. Naturally, this also works the other way around when investor’s confidence decreases. Looking at Catalan bond yields, one can see that despite a sharp increase in August for the bonds maturing in one year, yields barely moved in light of the more recent developments. Most investors did not seem to believe Catalonia would become independent, but followed the event with caution. This was fuelled by the uncertainty surrounding the vote both in- and outside of Spain, which made it difficult to price the event in the market. 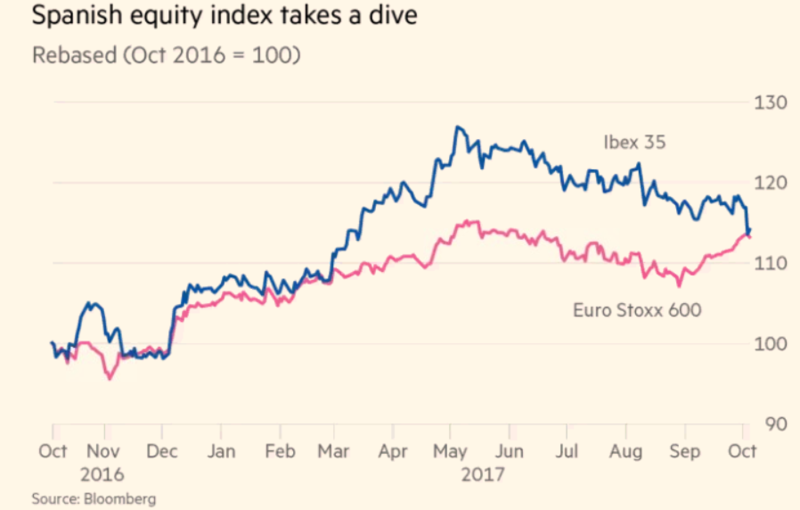 That became apparent too in Spain’s main equity index, the IBEX 35 Index, which did not reflect any signs of panicking investors getting rid of their stocks. When financial markets opened on the 2nd of October, Spanish equity funds tumbled down, the euro weakened significantly against the dollar and bond yields went up. The IBEX 35 Index took losses of more than 10 percent that week. Clearly, investors were now betting on the vote being bad news for Spain. Despite the vote being deemed illegal by the Spanish government and the European Commission agreed in saying that they would not recognize the vote, some companies already decided to move their headquarters out of Catalonia. The national government even passed a law the exact same week making it easier for companies to move their headquarters out of the region, increasing the potential economic burden put on the Catalans. During the last weeks, the expectations that outflows may only be short-lived seemed to be increasingly unlikely, despite the fact that the financial markets were regaining ground. Between the 2nd and the 26th of October, a stunning number of 1,681 companies moved their official base from Catalonia to other parts of Spain according to official records. Most of them are worried about losing access to the European Union. Outside of Spain the referendum was barely noticeable. The Euro reacted a few times as a result of announcements from either the local or national government, but recovered quickly. Investors considered it to be a domestic issue, mostly taking place in the Spanish financial markets. However, last Friday Catalonia’s parliament officially declared independence which was followed by the central government announcing to take direct control of Catalonia and firing the regional government. In addition, they announced new elections on the 21st of December. Obviously, this increased political tensions. During the weekend, demonstrations against and in favor of a Catalan independence took place, one union called for a labor strike and Puigdemont called for a democratic opposition against Madrid. The Catalan ministers started their day full confidence on Monday, but uncomfortably left their offices later on. Financial markets reacted positively to this calm, with stocks being on the rise and yields going down. The question that remains is how this will further evolve. Should the Catalans continue its campaign, the uncertainty about its autonomy will worsen the outlook not only for the region’s economy, but for Spain too. Moreover, it could trigger a further destabilizing effect in the European Union as other areas, like the Flemish separatist movement in Belgium or Scotland in the U.K., could be encouraged to vote for independence too. A further splintering of the European Union that is already struggling with becoming more unified, would have a negative effect on its economic and market outlooks. However, this scenario seems unlikely. No European government has provided support for the Catalan region so far, except for Finland that was considering recognizing Catalonia as an independent republic. The fact that companies are moving their headquarters and the threat that bank deposits may flee Catalonia-based banks does not help either. Moreover, the Spanish government has strongly reacted to the opposition and immediately imposed article 155 of the country’s constitution to cancel Catalonia’s autonomy last Friday. Yet, the latter move could work counter-productive as the Catalans in favor of independence would be even more incentivized to go against its government. Either way, investors could see this as an opportunity. 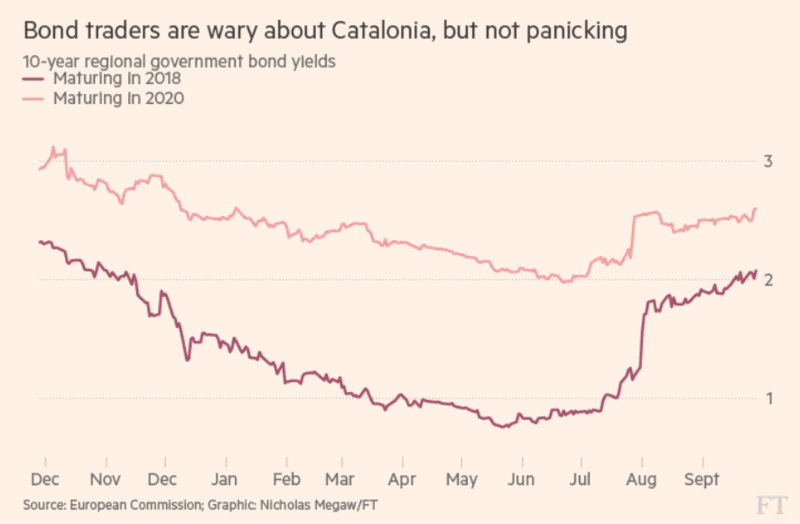 In light of the Catalan threat, Spain is expected to further speed up significant reforms in cleaning up its banking system after the property collapse a few years ago. Moreover, additional measures to attract direct investments into Spain may be implemented by the national government. As the European Union benefits from a stable Union, they will certainly take measures to ensure this as it now has become an international problem. A further extension of its bond purchasing program for example already helps to bring bond yields down in Spain. As has become clear, maximum effort will be expected to put in comforting the financial markets, making sure that investors will not turn their back onto Spain.